Line a 9 x 9 inch pan with non-stick foil. Set aside. Place semi-sweet chocolate chips and food coloring in a heat safe bowl and set aside. In a large, heavy saucepan, combine, sugar, butter and half and half. Cook to 234º, stirring occasionally. Immediately add white chocolate chips, marshmallow cream and vanilla. Mix to combine. When well mixed, scrape half of the white chocolate fudge into the bowl with the semi-sweet chocolate chips and mix till melted and smooth. 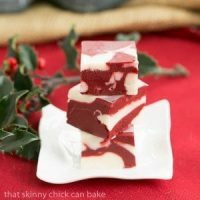 Using two medium cookie scoops or tablespoons, place scoops of red and white fudge in the prepared pan, alternating flavors. Drop pan from a few inches above counter a couple times to remove any air pockets. With a knife, swirl though the fudge to give a marbelize appearance. Allow to cool at room temperature. When cool, remove from pan using foil and cut into squares.